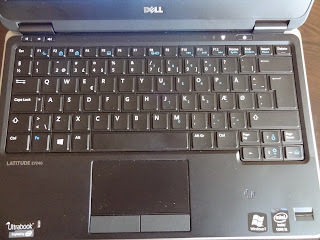 Acer Aspire V5-573G review - this is one very capable laptop from Acer's V5 laptop series which offers high performance in a compact size and very competitive price. Acer Aspire V5-573G is also recommended as entry level gaming laptop thanks to its powerful NVidia GeForce 750M video card. Actually the Aspire V5-573G is very powerful laptop. Thanks to its Intel Core i7-4500U processor and 8 GB of RAM this laptop achieves great performance figures. The space for storage is also massive - 1 GB 5400 rpm SATA HDD. This laptop can be also find with optional 128 SSD drive for additional storage and better start up time. One of the best features in the Acer Aspire V5-573G laptop is the 15.6-inch Full HD IPS LED-backlit anti-glare (matte) display which is an option for most Acer V5 laptops but here we have it as standard. This display has supports resolutions of up to 1920x1080 and is significantly better than the basic LED screen of the V5-series laptops. And in addition to the good display you also get built-in HD webcam with mic in the top-middle of the screen frame. The fast Core i7 processor, powerful NVidia GeForce 750M graphics and the gorgeous IPS display make this computer one very capable compact gaming machine. The connectivity options in the Aspire V5-573G are also pretty good. This laptop has HDMI port, 2x USB 2.0, 1x USB 3.0, RJ-45 (LAN 10/100/1000 Mbps), VGA, 3.5mm audio out, microphone in and Bluetooth 4.0. Acer Aspire V5-573G also has a very good set of stereo speakers with Dolby Home Theater v4 which provide nice, clear sound, especially for such compact 15.6-inch laptop. The battery of the Aspire V5-573G doesn't have very large capacity but it holds charge for more than 4 hours thanks to the power saving options and energy efficient hardware. Acer Aspire V5-573G usually comes preinstalled with Windows 7 Home Premium 64bit operating system but you can order it with different one. As I already mentioned the price for all these mighty hardware is very good. This laptop can be found for around $1100 for the US market and around 800 Euros in Europe. I personally think this is one very good laptop which is definitely worth the money. Acer Aspire V5-573G is a solid build machine with very good performance which is also quite suitable for gaming laptop thanks to its fast processor and good graphics card. It can also be found in few different color choices including the popular metal silver and titanium black. I would also suggest to look at the rest of our laptop reviews and learn more about the latest products from this segment. You can also take a look at one of the Acer's V3-series 15.6-inch laptops Acer Aspire V3-531 which is significantly cheaper.